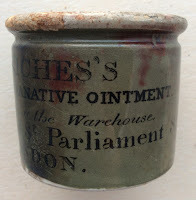 This is a recently discovered ointment pot with a London retailer address, found in 2010 at a boot fair. It is a large pot which has a striking grey coloured glazed body and white glazed interior standing 66 millimetres tall. 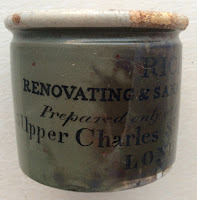 Unfortunately it has some staining which might be difficult to remove. Information as to its origin is yet to be researched. book produced by Messrs. Houghton & Priestley. 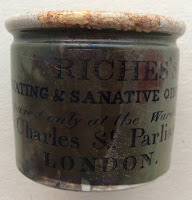 It is planned to include this pot in the Ointment Pots update section of the new Pot Lids book expected to be published 2012.